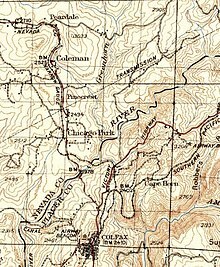 The Nevada County Narrow Gauge Railroad (NCNGRR) (nickname: Never Come, Never Go) was located in Northern California's Nevada County and Placer County, where it connected with the Central Pacific Railroad. The Nevada County Narrow Gauge Railroad Company incorporated on April 4, 1874, and was headquartered in Grass Valley, California. After two years of construction, passenger and commercial rail services began in 1876 and continued until 1943. 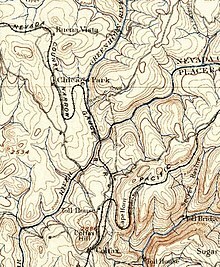 The 22.53 mi (36.26 km) line ran from Colfax, north through Grass Valley to Nevada City. At one time, the railroad was notable for having the highest railroad bridge in California, the Bear River Bridge, built in 1908. The need for rail service in the semi-mountainous and wooded area of Grass Valley and Nevada City was precipitated by mining operations subsequent to the California Gold Rush. In addition, timber operators wanted to make their land accessible to the Southern Pacific Company in Colfax. 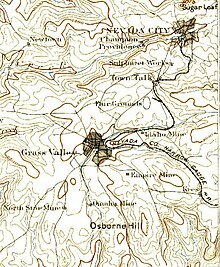 On March 20, 1874, the California legislature and Governor Newton Booth approved the right to build and operate a 3 ft (914 mm) narrow gauge from Colfax, through Grass Valley, to Nevada City. On June 20, an Act of Congress granted the railroad right of way through public lands. J. H. Bates estimated that construction and equipment would total $411,132. Only one bid came in and it was for $500,000, signed by M. F. Beatty; he received a lump sum of $500,000. Construction began January 1875. Turton & Knox were subcontracted for earthwork. John Flint Kidder was the chief engineer. Within two months, 600 men were employed in the railroad's construction. Construction included two bridges, two tunnels, and five trestles. After leaving the Colfax depot, the road headed north, parallel with the Central Pacific Railroad, then crossed Bear River, and into Nevada County. One of the first stations was at the town of You Bet, which serviced the Goodwin Drift Gravel Mine. The road proceeded into Chicago Park, a fruit and grape growers colony, and then continued into Grass Valley. All cars and locomotives had Westinghouse railway brakes, and cars used for passenger service had Miller Platform couplers. As the first contractor, Beatty, was unable to complete the project, a second, J. K. Bynre, was brought in; construction was completed in the spring of 1876. The inaugural train, from Colfax to Grass Valley, ran on April 11 and by May 20, the first train reached Nevada City. The company's first President was John C. Coleman, president of the North Star Mine. Kidder, the builder, decided to settle down in Grass Valley, becoming the General Superintendent, and in 1884, became the second president. Upon his death in 1901, Kidder's widow, Sarah, took over, becoming the first female railroad president in the world. 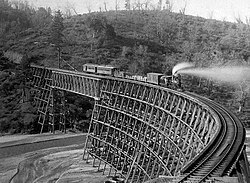 In September 1907, a 3.56 mi (5.73 km) "cut-off", at a cost of $132,285 was built, bettering the grade. The following year, construction was completed on the Bear River Bridge. By 1912, the NCNGRR was running three mixed trains daily, each way, between Nevada City and Colfax, while a fourth mixed train ran daily, each way, between Grass Valley and Colfax. Sarah Kidder sold her interests in 1913 and retired to San Francisco. In 1926, Earl Taylor and his associates purchased the railroad for $1. With the outbreak of World War II, they sold it in 1942 for $251,000 to Dulian Steel Products Company and the last train to run over the line was on May 29. Each combination coach had a small iron safe in the baggage compartment. Though $200,000,000 in gold was hauled out of Nevada County by the NCNGRR during its operation, there was never an attempted robbery. Nevada County: The main line was 16.79 mi (27.02 km) long, and had 2.39 mi (3.85 km) in spurs and sidings. Minimum radius of curvature: 302.9 ft (92.3 m). Engine 1, nicknamed Grass Valley, was built in July 1875, and was in service 1875–1936. Engine 2, nicknamed Nevada, was built in July 1875, and was also in service 1875–1936. Engine 3 was built in September 1877, and was in service 1877–1915. Engine 5, named Tahoe, was built in March 1875, and was in service 1899–1940. Engine 7 was built in August 1881, and was in service 1929–1934. Engine 8 was built in February 1882, and was in service 1933–1942. Engine 9 was built in April 1914, and was in service 1933–1942. The Glenbrook was built in 1875, and was used as a parts source for sister locomotive No. 5. This engine never operated on the NCNG. Engine 4, nicknamed Santa Cruz, was built in 1875 by Porter-Bell, and was in service 1899–1916. Engine 6 was built in 1883 by New York Works, and was in service 1915–1921. Engine 10 was built by Fate-Root-Heath Company of Plymouth, Ohio, and was in service only during the first six months of 1936. Engine 11 was built by Whitcomb Manufacturing Company of Rochelle, Illinois, and was in service 1936–1942. There were several notable passengers, including presidents Ulysses S. Grant and Theodore Roosevelt, singer Emma Nevada, and Britain's Prince Albert. In the centennial year after the railroad began operations, E Clampus Vitus erected a historical marker in Colfax at 39°6.011′N 120°57.159′W﻿ / ﻿39.100183°N 120.952650°W﻿ / 39.100183; -120.952650﻿ (Nevada County Narrow Gauge Railroad) near the old NCNGRR depot, the southern end of the line. The Nevada County Narrow Gauge Railroad & Transportation Museum was created in recent years near the northern end of the line in Nevada City. ^ Commissioners of Transportation, California (1877). Report of the Board of commissioners of transportation, to the Legislature ...: December 1877 (Digitized Feb 14, 2009 ed.). Sacramento: F.P. Thompson Supt. State Printing. p. 415. ^ "NCNGRR". ncngrrmuseum.org. Archived from the original on 2011-07-27. Retrieved 2009-05-24. ^ Alexander Thompson Britton, ed. (1881). Laws of the United States of a local or temporary character, and exhibiting the entire legislation of Congress upon which the public land titles in each state and territory have depended: December 1, 1880. Embracing, also a digest of all Indian treaties affecting the titles to public lands. Digitized Oct 24, 2007. United States Public Land Commission. Government Printing Office. p. 1075. ^ Journal: Appendix. Reports. 3. California Legislature. 1891. p. 21. ^ a b Kneiss, Gilbert H. (1946). Bonanza Railroads. Stanford Univ. Press. p. 170. ISBN 0-8047-2413-X. ^ a b c "Nevada County Narrow Gauge Railroad, Transportation In Nevada County". ncgold.com. Archived from the original on 2013-02-08. Retrieved 2009-05-24. ^ "California journal of mines and geology". California Journal of Mines and Geology. Digitized. California State Mining Bureau. Dec 18, 2008: 317. 1893. ^ Biennial report ... (Digitized Jul 11, 2007 ed.). State Board of Horticulture. 1892. p. 398. ^ a b Whittle, Syd (December 15, 2008). "Nevada County Narrow Gauge Railroad 1876–1942, Placer County Terminus". hmdb.org. Retrieved 2009-05-24. ^ Locomotive Firemen's Magazine. 46 (Digitized Mar 5, 2008 ed.). Brotherhood of Locomotive Firemen. 1909. p. 821. ^ Brower, Maria E. (2006). Gold Rush Towns of Nevada County. Arcadia Publishing. p. 40. ISBN 0-7385-4692-5. ^ a b "A catalog for narrow gauge locomotives". J. B. LIPPINGOTT. 1885. p. 10. Retrieved 2009-05-24. ^ a b "Engines of the NCNGRR, 1875–1942". ncngrrmuseum.org. Archived from the original on 2011-07-27. Retrieved 2009-05-24.